Product #21385 | SKU 4470 | 0.0 (no ratings yet) Thanks for your rating! The 896mk3 from MOTU is a hybrid digital audio interface that features both FireWire and USB 2.0 connectivity. The interface can also function as a rack-mount, standalone mixer without the need for a computer. 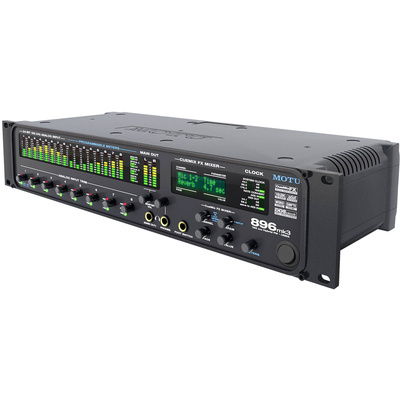 It provides eight channels of 24-bit/192kHz analog recording and playback, combined with sixteen channels of optical digital I/O, stereo AES/EBU, S/PDIF, and separate analog main outs. An on-board CueMix FX digital mixer allows for routing guitars, synthesizers, keyboards, drum machines and even effects processors with no latency and no processor strain on the host computer. Hardware DSP-driven effects processing can be applied to inputs, outputs and busses independent of the host computer. DSP effects include the Classic Reverb with reverb times of up to sixty seconds, and a seven-band parametric EQ featuring filter types modeled after British analog console EQs. Also included are a conventional compressor and the Leveler, an accurate model of the legendary LA-2A optical compressor that provides automatic gain control. All analog inputs are equipped with V-Limit, a hardware limiter that helps prevent digital clipping from overloaded input signals. Additional protection can be applied to the microphone/guitar inputs by enabling the Soft Clip feature, which engages just before clipping and helps reduce perceptible distortion. Powered monitors can be plugged directly into the outputs of the interface and the output attenuated from the software or a front-panel control. Main out volume is not limited to stereo operation, and includes quad, 5.1, 7.1 and even user-defined configurations are available. Additional programming allows for all thirty-two outputs to be controlled with the master volume knob.